[Nice Kit:] Come in your hand would be a nice kit with 11 various anchors with screws can meet your any requirement, different size and styles for you to decorate your house. They are packed in a durable plastic box, convenient for your use and storage. 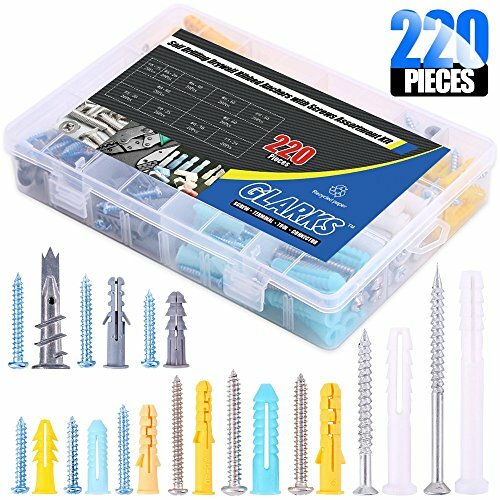 [Quality Assurance:] The plastic(nylon) material anchors are very durable and not easy to be broken, drywall self-drilling screws kit is made of high quality stainless steel, which features is strength and offers good corrosion resistance in bad environment like high temperature, cold weather, and high humidity areas. They have superior rust resistance and the excellent of oxidation resistance, which can ensure long time using and prolong screws lifespan. [Expansion design:] The split in the ribbed anchors expand on two opposing sides as you tighten the screw , increased holding power,Anti-rotation structure design of the expansion sleeve, tighten the screw will not be followed in the drilling rotation. [Hollow-Wall Anchors]: High quality anchors pre-drills precise hole in types of drywall - No hole preparation required, constructed from durable zinc to last for years and can be easily removed. Deep thread design provides strong engagement, locks into many sizes of drywall for maximum holding power. [Multi-purpose]: These drywall anchors and screws is perfect for hanging a wall shelf in fairly soft drywall. You can use the kit to hold your blinds or shelf, and the ribs on the plastic drywall anchors prevent the anchor from turning in the hole during installation.